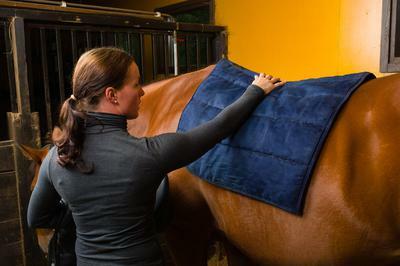 To groom a horse, you'll need five basic tools: the curry comb, the hard or dandy brush, soft or body brush, mane and tail brush/comb, and a hoof pick. The curry comb - a rubber bristled brush used in circular motion to loosen caked mud and dirt from the horses coat. The hard or dandy brush - a hard bristled brush used in short quick stokes to removed the dirt you loosed with the curry comb. The soft or body brush - a soft-bristled brush used in long soft strokes for a final polishing on the coat. The mane and tail brush/comb - used to detangle and straiten the mane. Never comb the tail during the winter as the hairs do not grow back. The hoof pick is used from heel to toe and is used to removed mud from the hoof, and rocks that may have been picked up. Hope y'all enjoyed this! I am going to make this into a series. Next time, it will be tacking up so get ready for that! Thanks for the tips! They'll be helpful reminders! Wow, I learned a lot. Thanks!